Since Francis became pontiff, the narrative has been that he was called to change everything in the Church. To cut out the ancient traditions. To “empty out” the Church, making her poor among the poor. Even to put aside, for the sake of a more spiritual Church, all those institutions that were part of the Holy See and Vatican City State. Also, the Pope of the peripheries was called to decentralize the Church’s government, to give more weight to the local Churches and to emphasize pastoral work rather than doctrine. Are these really the goals of a pontiff? Or is a pope called to reform, looking at the signs of the times without giving up the patrimony that the Church has held for two millenniums? Seen from the outside, cutting with the past seems necessary, as many traditions appear useless. Truth is that those who do not have a sense of the Roman tradition cannot understand the Church’s traditions at all. Without an understanding of the Church’s traditions, they cannot get that sense of the Roman-ness at the base of the notion of the Roman, Catholic, and Apostolic Church. 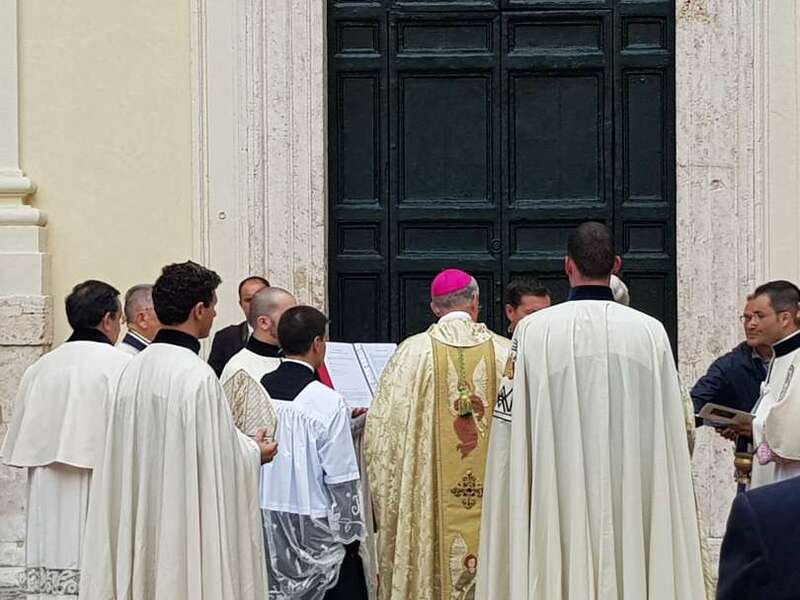 On July 26, Saint Anne’s day, the Arch-confraternity of the Parafrenieri – who are named after the decorations of horses – celebrated its feast with a Mass in the church entrusted to it, Santa Caterina della Rota, in Rome. The event is a good example of what the Roman tradition at the base of the Church’s life is. “Primicerius” of the arch-confraternity is the Prefect of the Pontifical Household, as the parafrenieri themselves are part of the pontifical family. That means that the pontifical family changed shape and duties, and that many of the old titles do not exist anymore, as times have changed. However, this world has still an important place in the life of the Vatican. The arch-confraternity’s membership includes the “Sediari pontifici”, once those who carried the pope’s chair and nowadays accompany heads of state and monarchs in their visits to the pope, following a very ancient ceremonial that shows the weight and history of the Holy See as guests approach to meet the Vicar of Christ. That the old titles change, but are not lost, is shown by the evolution of the title of Monsignor. Paul VI extended the title of monsignor to everyone who was considered part of the pope’s family. It was an honorific title, no longer linked to the functions of a court and to service close to the pope side in the Apostolic Palace. There were three ranks of monsignor: chaplain of his holiness, for priests at least 35 years old and 5 years in the priesthood; prelate of honor of His Holiness, for priests 45 and older, with 15 years in the priesthood; and apostolic protonotarius for priests 55 and older, and with 20 years in the priesthood. Pope Francis took a further step: On Jan, 7, 2014, he asked the Secretary of State to issue a norm that ended restrictions that limited to the monsignior rank of chaplain of His Holiness diocesan priests, age 65 and older. No changes were made for Holy See officials. A small change, in essence. The decision to give the title of monsignor beyond Rome was made in order to let everyone feel part of the Roman Church, and united in service to the pope according to a universal criterion. This was Paul VI’s rationale when he signed the reform of the titles and of the pontifical household with the 1968 decree Pontificalis Domus. Reading that document helps us to understand that Paul VI never abolished the pontifical court, but merely adapted the old functions to the spirit of the times. Nothing, in that document, can let us to think that Paul VI wanted to empty out the Church. The document rather shows that the Blessed Pope did not want to lose a comma of the past. Paul VI’s noted that – “because the pope is the visible head of the Catholic Church and king of a temporal state recognized by the civil authorities of several peoples” – the popes always picked “faithful, fit and able people” among priests and lay people to meet the needs of the liturgical service and of the service to the temporal state. Why was nothing abolished? Because Popes always had around them a family comprised by clergy and lay people; they have always developed a collegial administration, involving all the social layers and giving Cardinals an important role in partaking in the Church’s decisions. The same ancient functions that survived for centuries and to the torments of history, because they have always been able to renew themselves, are a constitutional part of the history of the Church. These functions represent the Church’s being at the same time for the people and hierarchical; being at the same time a State to protect the human being and spread the voice of God to the world, and also a spiritual entity to provide a moral light based on the Gospel. Manipulating the scandals to attack the Church, which anti-clerical campaigns have always done, never withstands the test of time. Human mistakes have always been overcome by this great tradition that gathers everyone around a great universal mission: that of evangelization. There is no reform in the Church with no continuity with the past. It is not probably by chance that Benedict XVI began and ended his pontificate speaking of the Second Vatican Council and of the hermeneutic of continuity, showing once again that the strength of the Church is not in exterior revolution, but in the conversion of hearts. It is not by chance that Pope Francis has always been speaking of the conversion of hearts, while he seems unenthusiastic when talking of the Curia reform. However, his exaltation of peripheries lead us to think about a progressive detachment from the Roman tradition. In creating cardinals seemingly following criteria of representation, recruiting them according to geography, Pope Francis seems to resort to the tradition of making everyone part of Rome. On the other hand, the exaltation of the local bishops’ conferences, even at the expense of doctrinal issues, makes of the Curia one of the many centers. This points to a rationale of dismantling that the enemies of the Church cannot but appreciate, while the Church risks to be deprived of her constitutive identity. In the end, there is the need to re-understand Roman-ness. As historian Angela Pellicciari underscored, secular forces want to seize Rome because Rome represents the world. The prince of the Apostles came to Rome to give impetus to that extraordinary history of evangelization began with the incarnation of the son of God.